The new year has seen a redoubling of the efforts by the Chinese Communist Party leadership to oust the faction headed by former regime leader Jiang Zemin. The Party’s anti-corruption watchdog announced on Jan. 6 that it will now scrutinize the entire governing apparatus of the Chinese regime. A total of 47 inspection teams will be tasked to watch over all 139 Party and state departments for any wrongdoing, according to an announcement on the Chinese Communist Party’s disciplinary agency’s website. “Sending inspection teams to all departments is crucial to eliminating any blind spots in supervision within the Party,” said Yang Xiaodu, the deputy head of the Central Commission for Discipline Inspection (CCDI). The disciplinary inquest of the Party’s governing bodies began last January. The CCDI dispatched inspection teams to four key departments in the Party’s Central Committee—the General Office, Organization Department, Propaganda Department, and United Front Work Department. The Central Committee is an important leadership body in the Chinese regime. Inspection teams were also sent to the office of the State Council, China’s equivalent of a cabinet; the National People’s Congress, the regime’s rubber stamp legislature; and the Chinese People’s Political Consultative Conference, an advisory body to the legislature. The CCDI already counts Zhou Yongkang, among its scalps. The former regime security czar was sentenced to life in prison last June. During this round of inspections, critical Party departments like the Ministry of Foreign Affairs, Ministry of Public Security, Police Research Office of the Central Committee, and the Political and Legal Affairs Commission are expected to come under closer scrutiny for misconduct, according to Beijing News, a semi-official news outlet. The CCDI already counts the former head of the Political and Legal Affairs Commission, Zhou Yongkang, among its scalps. The former regime security czar was sentenced to life in prison last June on charges of receiving bribes, abusing power, and leaking state secrets. Under Zhou’s reign, the millions of security officials and agents under the Political and Legal Affairs Commission’s command frequently brutalized practitioners of the spiritual discipline Falun Gong, house Christians, ethnic minorities like Uyghurs and Tibetans, and Chinese dissidents. The domestic security apparatus had a budget higher than that of the People’s Liberation Army when Zhou, a key ally of Jiang Zemin, was at the helm. Party officials who boast links with Jiang or actively partake in his pet project—the persecution of Falun Gong—have been methodically purged since Xi Jinping began his anti-corruption campaign three years ago. This trend shows no sign of abating barely a week into the new year. On Jan. 4, state-run media People’s Daily Online announced the investigation of Xiu Hui, a former provincial deputy public security department head who oversaw labor camps where prominent cases of persecution of Falun Gong practitioners were reported. The following day, the CCDI announced the expulsion of Lu Xiwen, former Deputy Party Secretary of Beijing, from the Party. Hong Kong media outlets have reported that Lu owes her promotion to Jiang Zemin. Jiang himself appears to have been singled out by Xi Jinping. In a new book of collected speeches released on Jan. 2, Xi accused some Party leaders of becoming a “Taishang Huang,” a Chinese allusion that references retired leaders who still play at godfather, holding significant sway over important political matters of the day. Analysts say this allusion pointed unmistakably at Jiang, who is well-known for having meddled in regime business since his official retirement as Party leader in 2002. 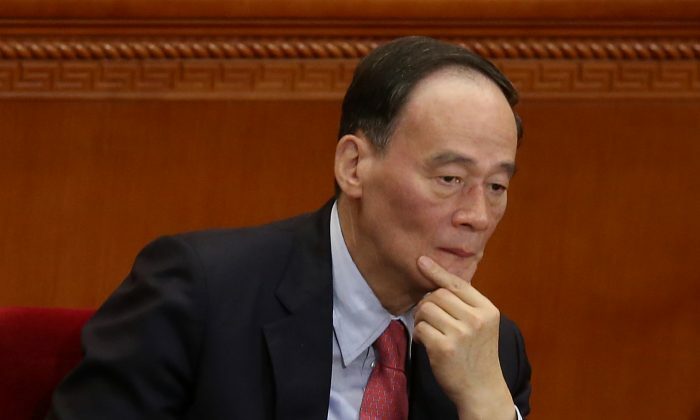 Using the age-old Chinese literary device of using allusions to communicate meaning, Xi Jinping has indicated his intention to remove two powerful, former officials. Xiu Hui, the deputy head of security bureau, and the head of labor camp and prison in Xinjiang, is under investigation.